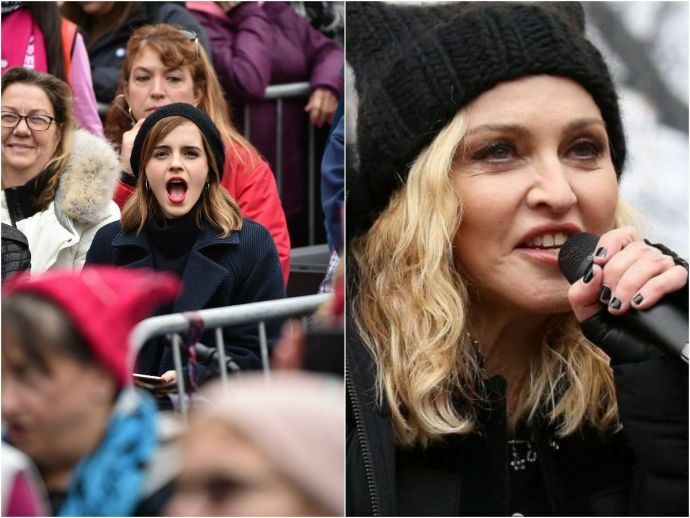 Women's March On Washington: Anti-Trump Protests Take A Celebrity Turn With Madonna, Emma Watson! Women's rights are human rights, #WomensMarchonWashinton. Women from all over the world took to the streets demonstrating against the 45th President of the United States, Donald Trump. And it was due to these celebrity ladies that the movement gained momentum quickly, and took the Trump officials for a ride! Stars led the women's marches in Washington and other cities to send the new president a pointed message that he was in for a fight and that, as so many signs said, women's rights are human rights. Madonna, Julia Roberts, Scarlett Johansson, Cher, Alicia Keys, Katy Perry, Emma Watson, Amy Schumer, and feminist leader Gloria Steinem were among those present at the march in Washington, where reports said the crowd had swelled to half a million. Donning a pointy-eared "pussyhats" mocking the new President stretched far and wide, Madonna took to the stage and said,"Yes, I have thought an awful lot about blowing up the White House," she said. "But I know that this won't change anything. We cannot fall into despair." Instead, she called for a "revolution of love". The likes of Miley Cyrus, Ariana Grande, Lena Dunham, Sir Ian McKellen, Jake Gyllenhaal, Kristen Stewart, Nick Grimshaw and Charlize Theron got involved with the movement in other parts of the country like New York and Utah. Our very own Indian representative PeeCee who is all Hollywood now, could not be a part of the peaceful protest due to her busy shooting schedule. However, Priyanka took to Twitter to say, "So proud of all my sisters and the men that are at the #WomensMarch I'm so upset I couldn't go. #girllove #womensrightsarehumanrights."